Aim: This study involves the effect of different household processing on nutritional and anti-nutritional factors in moth bean (Vigna aconitifolia) and Sorghum (Sorghum bicolour (L.) Moench) seeds and with their product development. Methods: This study involves the effect of different homemade processing of moth and Sorghum on proximate composition and anti-nutritional factors and further development of certain products using processed moth and Sorghum flours. Results: During the process of soaking, the moisture content, and vitamin C contents were found to be increased; with a significant decrease in ash content, fat content, crude fiber content, protein content in both samples (except iron content). In moth bean, 72 h germination process resulted in a decrease in moisture content, fat content, crude fiber content, with an increase in ash content, protein content, iron content, and vitamin C contents whereas in Sorgum all the contents were decreased except moisture content, and vitamin C contents. Ash content, protein content, iron content and vitamin C content with a significant decrease in moisture content, fat content, and fiber content. After processing, the anti-nutritional factors were also decreased in both samples. The modified recipes with the processed moth bean, Sorghum, and blended flours were developed as thalpeeth and papri-chat and acceptability studies of products were carried out and compared with standard. It was found that all samples were acceptable to panel members making then quality for the potential usage as delivery vehicles for use gluten allergy, scurvy, and malnourished children. Conclusion: We can conclude that moth bean and Sorghum to our diet will help to improve the nutritional profile at low cost. The unique nutritional composition of moth bean and Sorghum will make a great scope to meet the nutritional requirement of malnourished people of our country. By taking this view, the present study was undertaken. To evaluate organoleptic acceptability of processed moth bean and Sorghum blended flour based products by nine-point hedonic scale. Phase I consisted of processing of moth bean and Sorghum. Both undergo for 10 h soaking process and germination process for 24 h, 48 h, and 72 h, respectively. Moth bean and Sorghum were obtained in bulk from local market of Shri Ganganagar (Raj) and were cleaned, dried, and stored safely in container. Processing of both, that is, soaking and germination (24, 48, 72 h individually) greatly enhance the nutritive values of grains and improve the shelf life. Selection of the best stage of both was carried out based on highest vitamin C content. Then moth bean and Sorghum flour as well as blended were prepared. Analysis of anti-nutrients of moth bean and Sorghum flours and blended flours: Tannins  and phytic acid  were estimated. In order to prepare recipes for this study, homebased recipes were selected, which could be enriched suitably to meet the objective of this experimentation. The criteria of selection were: Easy availability of ingredients, commonly consumed by local people. Keeping all these considerations in mind, processed moth bean and Sorghum flours were used to prepare value added products replaced with refined flour. Two products viz., thalpeeth and papdi chat were prepared in food science laboratory of Food Science and Nutrition Department, Banasthali University. These recipes first standardized and then replaced with refined flour in the products, after that sensory evaluation was done. Selection of panel members was carried out by triangle difference test and sensory evaluation was done by nine-point hedonic scale. For analysis and interpretation of data different statistical methods mean, standard deviation, and Student's t-test were used. Sensory evaluation of food products by nine-point hedonic scale. As predict in [Table 1], the moisture content of unprocessed moth bean and Sorghum were 10.30 and 9.8 g/100 g, respectively. After soaking the moisture content in the individual flours were 12.9, 11.44 g/100 g, respectively. As data indicated that the moisture content was found to be increased in both soaked samples. Whereas in 24, 48, and 72 h germinated moth bean flours had 12.6, 9.3, and 9.9 g/100 g moisture content, respectively. The moisture content was decreased significantly in moth bean. Whereas the moisture content in 24, 48, and 72 h in germinated Sorghum increased to 11.2, 10.2, and 10.7 g/100 g, respectively. The moisture content of Sorghum in all three germination period differed significantly from each other. The increase in moisture content was due to changes resulting from the uptake of water during soaking. Low moisture content was observed in germinated flour due to drying grain after germination. The samples were analyzed for their mineral ash content, that is, the total amount of mineral they contained. This help to evaluate the overall quality of the sample in term of their mineral composition and centrifugation. Data given on [Table 1] showed that unprocessed moth bean and Sorghum content were 3.0, 1.9 g/100 g, respectively. After soaking the ash content were decreased in both moth bean and Sorghum that were 2.8 and 1.7 g/100 g, respectively. After germination, the ash content in moth bean was increased 2.8, 2.84, and 3.12 g/100 g with the increased germination period. Whereas in Sorghum the ash content were 1.82, 1.85 g/100 g on all two stages of germination 24 and 48 h and it was decreased significantly on germination for 72 h.
Data given on [Table 1] indicated the fat content of unprocessed moth bean and Sorghum were 2.8, 4.66 g/100 g, respectively. This was reduced to 1.5, 3.34 g/100 g, respectively during the soaking process. The fat content in moth bean decreased 2.2, 1.99, 1.35 g/100 g significantly with the increased germination period at 24, 48, and 72 h, respectively. The trend for changes in fat content of germinated Sorghum flours had 3.28, 3.18, and 3.65 g/100 g, respectively in all 24, 48, and 72 h period of germination. The fat content in germinated Sorghum flours was significantly decreased than standard in all three germination period. Data given on [Table 1] indicated that the crude fiber content in unprocessed/standard moth bean and Sorghum were 4.34, 1.79 g/100 g, respectively and after soaking treatment crude fiber were decreased 4.2, 1.62 g/100 g, respectively. After germination fiber content significantly decreased in the samples, the moth bean and Sorghum. As dedicated in [Table 1] that protein content of unprocessed moth bean and Sorghum were 23.78, 12.56 g/100 g, respectively. Soaking of grains caused significant decreased in protein content in both moth bean and Sorghum 21.34, 10.54 g/100 g, respectively. Then subsequent germination for 24, 48, and 72 h caused significant increase in protein content on moth bean 24.10, 24.45, and 24.95 g/100 g, respectively. Whereas, in Sorghum seed with 24, 48, and 72 h germination had decreased 11.60, 10.32, and 10.20 g/100 g, respectively when compared to standard. Loss of dry weight (carbohydrates) during sprouting may show apparent increases in protein, while loss of low molecular weight nitrogenous compounds during soaking and rinsing of grains cause a decrease in crude protein on sprouting. Similar finding were reported by Kylen and McReady. Who attribute the increase to protein synthesis at the time of sprouting alfalfa, lentil, mung beans, and soybeans. It was also possible that the increase in protein was due to changes resulting from the uptake of water during germination. Iron content in unprocessed moth bean and Sorghum were 8.9 mg, 4.55 mg/100 g, respectively as shown in [Table 1]. After soaking the iron content was increased in moth bean (10.7 mg/100 g) but decrease in Sorghum up to (3.5 mg/100 g) when compare to unprocessed. Similarly, germination for 24, 48, and 72 h had increase in moth bean 9.5, 10.1, and 10.7 mg/100 g, whereas decreased in Sorghum with increased in germination period. The vitamin C content of unprocessed moth bean was 1.8 mg/100 g and in Sorghum was 0.6 mg/100 g as shown in [Table 1]. After soaking there were slightly increase in values 3.8, 1.2 mg/100 g in moth bean and Sorghum, respectively. The increase value by germination was in both. In moth bean 11, 11.8, and 8.5 mg/100 g with respect to increasing germination period. Same as with Sorghum value 1, 2, 2.8 mg/100 g content were increased. Germination process significantly influenced the nutrient content; as shown in [Table 2]. Most of the nutrients were slightly decreased, e.g. fat content, crude fiber, iron content, and protein content with an increase in moisture and ash and vitamin C content. As depicted in [Table 4], thalpeeth was made by tally replaced with processed moth bean flour, Sorghum flour, and blended flour. Data ranged from 6.85 ± 0.87 to 8.35 ± 0.58 for all attributes of sensory appearance, color, flavor, aftertaste, texture, and overall acceptability. 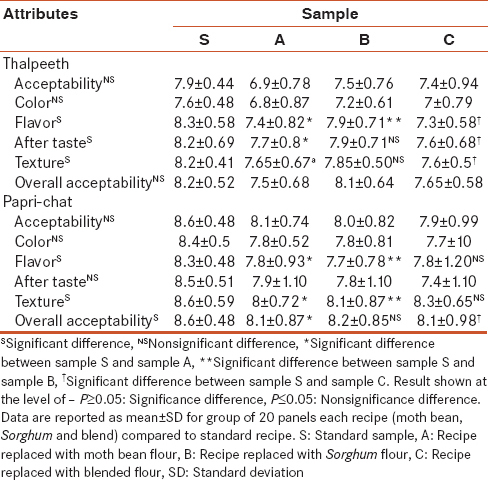 In all the test samples, the sample B (Sorghum flour) was more acceptable as compared to sample A and C.
As shown in [Table 4], papri chat was made by totally replaced with processed moth bean flour, Sorghum flour, and blended flour. The score between 7.45 ± 1.1 and 8.65 ± 0.59 for all attributes of sensory appearance, color, flavor, after taste, texture, and overall acceptability. Data depicted that according to overall acceptability sample B was more acceptable as compared to the standard sample. The samples A and C were also found to be similarly acceptable. They have slightly differed from each other thus all the test samples of papri chat were equally as good as standard. The problem of food and nutrition security is of paramount importance in India. The diet consumed by a large majority of the population in India are lacking in number of dietary essentials resulting in widespread prevalence of malnutrition. Pulses are relatively cheaper sources of protein than milk, cheese, meat, fish, almonds and cashew, etc., hence, valuable for the people who belongs lower income groups. The unique nutritional composition of moth bean and Sorghum will make a great scope to meet the nutritional requirement of malnourished and poor people of our country. As we know that moth bean rich in lysine amino acid and Sorghum is rich in methionine thus, they both fulfill each other requirement when we use these in combination. The underutilized food grains moth bean and Sorghum have a vast scope for not only supporting the commercially grown crops by reducing pressure on their availability, but they are cheap source of nutrients and can be raised at low management cost. However, these coarse grains also contain anti-nutritional factors such as phytate and tannins, which due to their iron binding effect worsen the situation of widespread prevalent iron deficiency anemia. Hence, it is recommend that for proper utilization of cereals and pulses. It is quite possible to get rid of these anti-nutritional factors and improve the bioavailability by using simple different domestic methods like soaking and germination have been proved to be beneficial for enhancing the nutritive value of moth bean and Sorghum. The present investigation reveals that soaking and germination process not only save the time, energy and fuel consumption, but also enhances the nutritional quality in raw materials (moth bean and Sorghum seeds) just before the development of food products. These processes also significantly reduce the anti-nutritional components in the same. Therefore, moth bean and Sorghum can be used as singly or in combination food products; therefore, considered to be one of the best preventable measures for disorders of protein malnutrition. Reicelly C. Functional foods a challenge for consumer's trends. Food Sci Technol 1994;5:121-3. Hulse JH. Nature composition and utilization of grain legumes. In: Jambunathan R, editor. Uses of Tropical Grain Legumes. Patancheru, India: ICRISAT; 1991. p. 11-30. Kawsar SMA, Huq E, Nahar N, Ozeki Y. Identification and quantification of phenolic acids in Macrotyloma uniflorum by reversed phase HPLC. Am J Plant Physiol 2008;3:165-72. Pawar VD, Ingle UM. Effect of germination on the functional properties of moth bean (Phaseolus aconitifolius Jacq) flours. J Food Sci Technol 1988;25:7-10. Elkhier MK, Hamid AO. Effect of malting on the chemical constituents, anti-nutrients factors, and ash composition of two sorghum cultivars (Feteria and Tabat) gown in Sudan. Res J Agric Biol Sci 2008;4:500-4. John RN, Tilman J, Scott R. Review novel food and nonfood uses for sorghum and millets. Bean J Cereal Sci 2006;44:252-71. Salunkhe DK, Kadam SS, Chavan JK. Nutrition quality of proteins in grain sorghum. Qualitas Plantarum 1977;27:187-205. Hulse JH. Polyphenols in cereals and legumes. Proceeding of a Symposium Held During the 36 th Annual Meeting of the Institute of Food Technologists, St. Louis, Missouri; 1979. p. 10-3. Ramakrishna V, Jhansi Rani P, Rao R. Anti-nutritional factors during germination in Indian Bean (Dolichos lablab L.) seeds. World J Dairy Food Sci 2006;1:06-11. Abusing AE, Hassan S, Amro B, Baiker EE. Fadil. Nutritional evaluation of cooked faba bean (Vicia faba L.) and white bean (Phareolus vulgaris L.) cultivars. Aust J Basic Appl Sci 2009;3:2484-90. Sharma S. Estimation of proximate chemical composition. Experimentals and Techniques in Biochemistry. New Delhi: Galgotia Publication Pvt. Ltd.; 2008. p. 55-60. Maynard AJ. Methods in Food Analysis. New York, London: Academic Press; 1970. p. 176. Ogunlesi M, Okiei W, Azeez L, Obakachi V, Osunsanmi M, Nkenchor G. Vitamin C contents of tropical vegetables and foods determined by voltammetric and titrimetric methods and their relevance to the medicinal uses of the plants. Int J Electrochem Sci 2010;5:105-15. Ranganna, S. Handbook of Analysis and Quality Control for Fruits and Vegetable Products. 5 th ed. New Delhi: Tata McGraw Hill Publishing Company Limited; 1986. p. 112. Tamilselvi N, Krishnamoorthy P, Dhamotharan R, Arumugam P, Sagadevan E. Analysis of total phenols, total tannins and screening of phytocomponents in Indigofera aspalathoides. J Chem Pharm Res 2012;4:3259-62. Chen QC, Li BW. Separation of phytic acid and other related inositol phosphates by high-performance ion chromatography and its applications. J Chromatogr A 2003;1018:41-52. Ahmed SM, Zhang Q, Chen J, Shen Q. Millet grains: Nutritional quality, processing, and potential health benefits. Compr Rev Food Sci Food Saf 2013;12:281-95. Mazahib AM, Nuha MO, Salawa IS, Babiker EE. Some nutritional attributes of bambara groundnut as influenced by domestic processing. Int Food Res J 2013;20:1165-71. Wu YV, Wall JS. Lysine content of protein increased by germination of normal and high-lysine sorghums. J Agric Food Chem 1980;28:455-8. Vale AP, de Quirós RB, López A, Hernández J. Impact of germination time on Brassica sprouts yield and vitamin C content Vale, A. International Conference on Food Innovation; 2010. Osman MA. Effect of different processing methods, on nutrient composition, antinutrional factors, and in vitro protein digestibility of dolichos lablab bean [Lablab purpuresus (L) Sweet]. Pak J Nutr 2007;6:299-303. Vasishtha H, Srivastava RP. Changes in lipids and fatty acids during soaking and germination of chickpea (Cicer arietinum). Indian J Agric Biochem 2012;25:14-9. Rusydi M, Noraliza MR, Azrina CW, Zulkhairi A. Nutritional changes in germinated legumes and rice varieties. Int Food Res J 2011;18:705-13. Kylen AM, McReady RM. Nutrient in seeds and sprouts of alpha alpha, lentils mung bean and soybeans. J Food Sci 1975;40:1008-9. Saha R, Dunkwal V. Development and nutritional analysis of value added spread instant mix. J Hum Ecol 2009;28:187-90. Rao PU, Deosthale YG. Tannin content of pulses: Varietal differences, and effects of germination and cooking. J Food Sci Technol 1982;33:1013-6. Deosthale Y. Pulses: Home processing and food value. Nutrition 1983;17:2-6. Eskin NA, Simpson BK, Down JS, Oke OL. Effect of local food processing on phytate level in cassava, yam, maize, sorghum, rice, cowpea and soyabean. J Agric Food Chem 1990;38:1580-5. Nielsen AV, Tetens I, Meyer AS. Potential of phytase-mediated iron release from cereal-based foods: A quantitative view. Nutrients 2013;5:3074-98. Reddy NR, Balakrishnan CV, Salunkhe DK. Phytate phosphorus and mineral changes during germination and cooking of black gram (Phaseolus mungo) seeds. J Food Sci 2006;43:540-3. Duhan A, Khetarpaul N, Bishnoi S. Effect of various domestic processing and cooking methods on phytic acid and HCl-extractability of calcium, phosphorus and iron of pigeon pea. Nutr Health 1999;13:161-9.